As the weather warms up the fleas and ticks will be ready to make their move on our pets. Pet owners must be ready to fight and save their pet from any pest that might be lurking. There are lots of great flea products now to help you along the way with protecting your pet so there really are no excuses for anybody’s pets to feel uncomfortable and itchy all season long. Don't miss this month's Frontline Plus product spotlight as we take a look at one of the top flea and tick preventative treatments available. 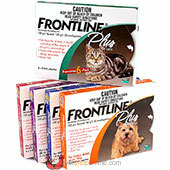 Read the full Frontline Plus product spotlight now.